Amsterdam is relatively a very small city. When it comes to distances Amsterdam is no London, New York or Tokyo. The possibilities of transportation in Amsterdam are diverse and all are very suitable to get across the city in a quick and/or comfortable way. If you visit Amsterdam the main area you probably will visit is the historic center. This historic center is only a few square kilometers big, so actually everything is within walking distance. Walking through the neighborhoods of Amsterdam is definitely the best way to get to know the city. Amsterdam is a city with a lot of small details and surprises, which you probably will miss when you rush the neighborhoods. When walking through the city, you have to watch out though for bicycles and trams. Bicycles pop up very quickly, very silently and without any warning. Locals on bicycles seem to have no mercy for tourists who walk on the bike lanes. Besides the bikes there are also the trams. Trams are everywhere and sometimes they go pretty fast through crowded streets. Be amazed by all the beautiful things you will see, but keep an eye on where you’re walking. The first thing you will notice when you come to Amsterdam is the amazing amount of bicycles everywhere. In our opinion the good old bicycle is the best way moving quickly through the city. Bicycles are quick and you can go every direction you like when you want to at any time. Because of this bicycles are far out transportation vehicle number one in Amsterdam. Every local has at least one bicycle at home. – Amsterdam is a busy city with a lot of traffic. So especially when you’re not that experienced on a bike you have to watch out. Bikes never win a collision with a tram. Also watch out for the tracks on the road for the trams. These are just a bit wider then bicycle tires and the tires get easily stuck in them which will certainly make you fall pretty hard. – Besides the busy traffic there are always a lot of people walking around. Some people are sometimes a little bit spaced out or just not paying attention on where they walk. They also might make some unexpected moves. 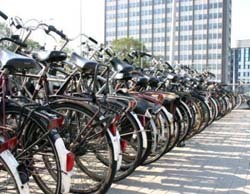 – Bike theft is an huge problem in Amsterdam. Lots of junkies make a living out of stealing bikes and selling them for cheap on the streets. These junkies are good in what they’re doing, so always make sure you lock your bike in the best possible way. On the other side… Don’t buy a bike on the streets for a few euros. You are just supporting the problem. Next time it might be your bike which gets stolen. Besides that, the police are these days very strict on this kind of criminality. When you get caught for buying a stolen bike you will face some serious problems. The argument you did not know the bike was stolen will not work in any case. The good old tram. The tram is an easy way for transportation, especially for the some longer distances. Especially in the center, trams are coming and going all the time which makes the waiting times never real long. There are about 17 tram lines in Amsterdam. With these trams you can visit almost all parts of the city. An important part of these lines begin and end their ride at Central Station. If you want to make usage of the tram you will need an OV Chipkaart (PT Smart Card). This card can also be used in the bus and the metro. For more information you can check the website of the GVB; the City Transportation Company. Amsterdam is loaded with taxis in all sorts and sizes. But the taxiworld in Amsterdam has a very bad reputation. This has several reasons; it is mainly caused by the high prices, the attitude of the taxi drivers and how they got in the news in an aggressive way the last few years. On the other hand; sometimes these guys are the savior of the evening when you’re stuck at a certain location. So the taxi is not our preferred method of transportation through Amsterdam. But sometimes it’s a method which just turns up to be the best option at that moment. Taxis are everywhere. If you need one, just throw your arm in the air and you will have success soon. The metro is not something a lot of visitors of Amsterdam will use. And there is also no reason to. The metro is only handy when you want to visit the outer neighborhoods of the city. For the metro you can use the same OV Chipkaart as in the tram and bus. 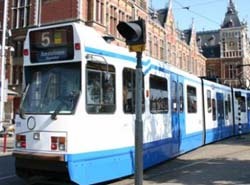 More information about the metro can be found on the website of the GVB; the City Transportation Company. There are about 30 bus lines in Amsterdam. You can forget about this option though. If you visit the center there will be no reason at all to prefer this method over any other available method. If you persist or are a bus fetishist you can check for more information the website of the GVB; the City Transportation Company.